The Celestron 0.63x reducer/corrector for Schmidt-Cassegrain reduces the focal length for SC telescopes (C6 - C8 - C9,25 - C11 - C14, not suitable for HD versions) to a f/6.3 focal ratio, increasing field of view and reducing exposition time. with a 24mm diameter corrected field. Designed for use in astrophotography, it is installed on the SC telescope in place of the visual back providing an output threaded to install the cameras (using an appropriate photo adapter not included) but also an off-axis guider or other accessories. The focal reducers are used in long-exposure astrophotography for deep-sky objects like nebulae, galaxies and star clusters, in order to improve pictures. 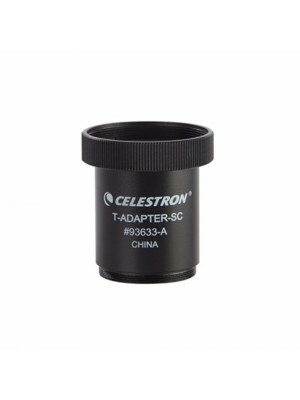 The Celestron 0.63x reducer/corrector for Schmidt-Cassegrain allows you to get a corrected field of 24mm diameter. The back focus is 85mm, so in order to provide the best performance the camera sensor must be set at 85mm away from the reducer's back thread. Installation is very simple, simply screw the focal reducer in place of the visual-back, connecting the optional photo "T" adapter, in order to get the correct backfocus distance. Then thanks to a T2 thread, you can connect any DSLR or CCD camera. The C6 - C8 - C11 - C9.25 - C11 f/10 telescopes f / 10 will become f6.3 while the C14 telescope will becomes f/7.